Author Sharon Schweitzer with me (in red) and Joan Marie Grable at a recent book signing event. …a book I could sit down and read for fun. 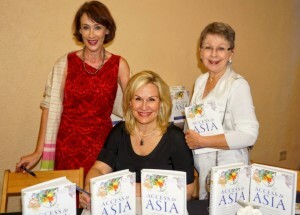 Well, we’re thrilled by that comment, not least because we think it should be enjoyable, as well as instructive, to learn how to successfully navigate the ten Asian countries included in the book: China; Hong Kong; India; Japan; Malaysia; Myanmar; The Philippines; Singapore; South Korea; Taiwan. We’re also thrilled that Access to Asia has struck a chord not just with a global business audience, but with university academics who are preparing tomorrow’s global leaders to understand, and be sensitive to, cultural differences around the world. I look forward to inviting Sharon to take part soon in a Q&A about the (often) challenging relationship between co-authors. Not least, how we transcended the all-too-commonly-experienced problems to “co-parent” a book that offers the very latest, on-the-ground insights on becoming culturally competent and global successful. In the meantime, check out all our reviews on Amazon and Goodreads. How might you find the cultural and business etiquette information in Access to Asia useful for your global business travels?